Pyer Moss Is Having a Pop-Up in NYC! Black cowboys and sports heroes, activists and forgotten black communities have all become a part of the Pyer Moss narrative. The label’s fifth anniversary presentation last September was a furtherance of its commitment “to building a narrative that speaks about heritage and activism.” Taking that mission to the source, the show was staged at the Weeksville Heritage Center in designer Kerby Jean-Raymond’s native Brooklyn, N.Y., once the site of a self-sustaining black enclave at the turn of the last century. That collection proved to be groundbreaking, earning the label their second nod from the CFDA, this time for 2019 Menswear Designer of the Year. But just in time for Spring, the label’s second collection is hitting stores, most excitingly, via their New York City pop-up shop from April 12-14. 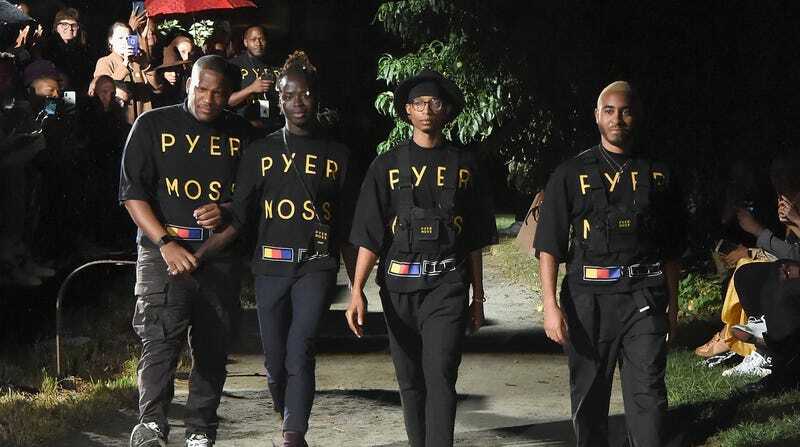 Local Pyer Moss fans can experience the label in person—including the latest releases from their ongoing collaboration with Reebok. The brand will also be hosting daily screenings of their short film, Seven Mothers. While we’re short on details about the film, it’s the latest in Pyer Moss’ ongoing series of striking, all-black-everything imagery, including a recent impromptu open studio campaign shot by Jean-Raymond himself with Amandla Baraka (this is the part where we advise you to follow the Pyer Moss Instagram, if you don’t already). Why do we ride so hard for Pyer Moss? Aside from digging its design aesthetic, in an era where it sometimes seems we’re begging mainstream luxury brands to consider giving us a seat at the table—let alone, be considerate in its design choices—Jean-Raymond’s label has always been for, by and in celebration of us. Shouldn’t we put our money where the motives are truly in our best interest? The Glow Up tip: The Pyer Moss Pop-Up Shop will take place at 107 Grand Street, New York, N.Y. Hours: Friday, April 12 to Saturday April 13: 11-8 p.m.; Sunday, April 14: 11-7 p.m. Not a New Yorker? Never fear; Collection 2 will also be available on the label’s site and at various retailers.